This is a TECHKEWL Phase Change vest with a 2 liter hydration pack built-in. Perfect to keep you cool and hydrated on hot days. Fill it with water or your favorite drink such as Gatorade to replenish your body's water loss and electrolytes. 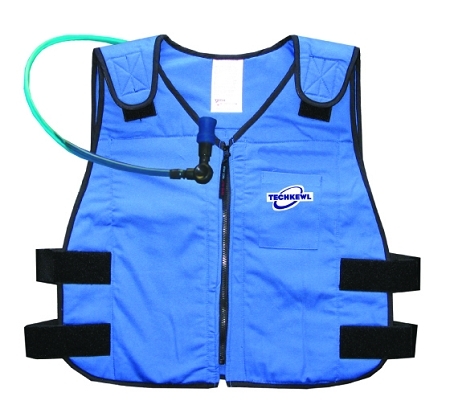 Each vest has side and shoulder "Velcro" adjustments to accommodate for various shapes and sizes. Custom size (smaller or larger than those listed) is available on request, but there will be a shipping delay. Available in blue only.